The photo you see is of the broccoli after I steamed it, but before I dressed it. Yes, the broccoli you see is naked. But it had been sitting in the refrigerator for almost a week, so I had to use it up, the theme of Frugal Fridays. 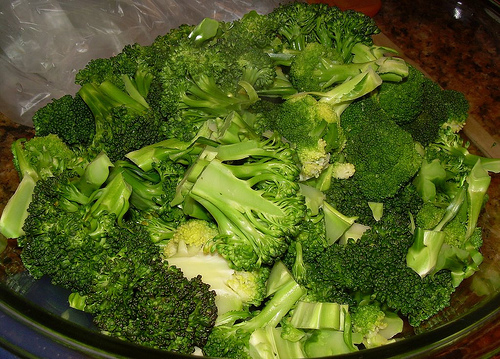 Steam some broccoli until it has reached a tenderness that you like. For me, that’s about 7-8 minutes. While it’s steaming, whisk together some extra virgin olive oil, lemon juice, the zest of the lemon, and some black pepper. Basically, you have just made a vinaigrette, and you can increase or decrease the olive oil and/or lemon juice to suit your tastes. Have some parmigiano reggiano on hand. When the broccoli is done steaming, toss it with the vinaigrette, and sprinkle some parmigiano over the top of it. That’s it! Light, healthy, and tasty. And a post on this blog that does not involve cream, butter, or cream cheese – will wonders never cease?! If you’ve never tried a strata before, you should seriously consider making this one. “Strata” means layers in Italian, and it is a great brunch/breakfast dish for two main reasons: (1) you put it together the night before, saving you time in the kitchen the following morning, and (2) people love a good one. I like fritatas, but I often find them to be very dry. Not so with a strata, which you can doctor up to suit your family’s tastes. Stratas are also a great way to use up odds and ends in your refrigerator, like little bits of cream, milk, or cheese, and are thus perfect for Frugal Fridays, wherein I use up the aforementioned odds and ends so that they don’t go to waste. 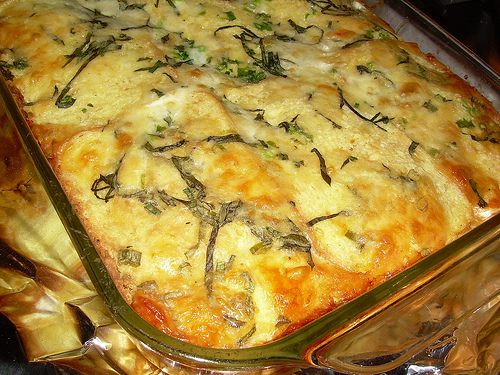 I’ve made a variation of this strata several times, and get rave reviews, as well as requests for the recipe. I leave out the goat cheese, and add roasted bell peppers. I use whatever combination of milk, cream, or half-and-half (light cream) that I happen to have around. The two critical elements in this recipe, in my opinion, are a decent bread (I prefer an egg bread like brioche or challah), and the fresh basil. I also add some fresh thyme, and Tabasco®, to which I seem to have formed an addiction. You can find the recipe after the jump, and if you want to join me for Frugal Fridays, here’s what you have to do! continue reading "A Breakfast Strata for Frugal Fridays"
During a recent purge of The Time Machine, aka, my freezer, I discovered a couple bags of bulgur that I bought a while ago, hoping to try my hand at tabbouleh. After watching an episode of Barefoot Contessa, I knew I had to make Ina Garten’s recipe. 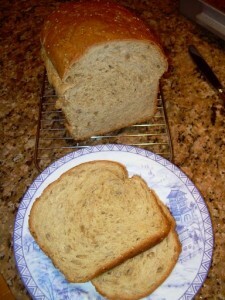 I had everything I needed in the pantry and refrigerator (the theme of Frugal Fridays), so I got to work. The result was delicious, just a tad too salty for me, so the recipe I’m including below has less salt than her original recipe. 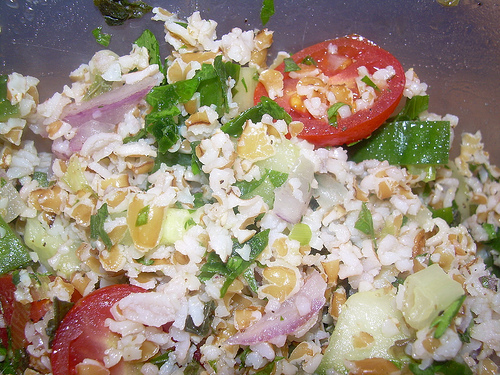 This is a quick, easy, high-fiber grain dish that I plan on making again and again. 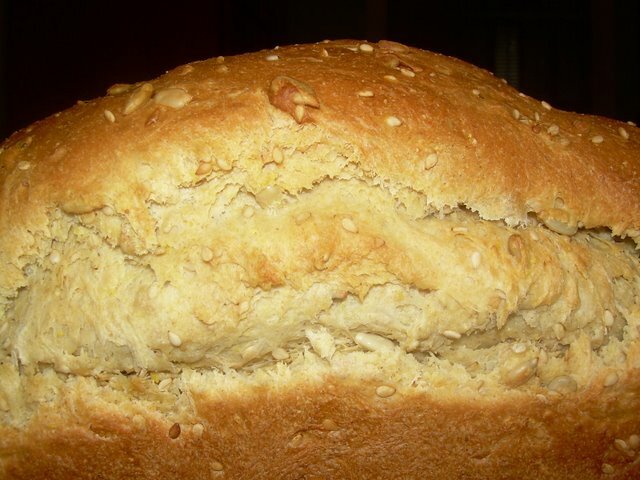 I’ve been trying to add some diversity to the grains that we eat, and this one is a winner. If you want to join me for Frugal Fridays, you can find out how to do it here. continue reading "Ina Garten’s Tabbouleh for Frugal Fridays"
I saw these last year on Tanna’s blog, My Kitchen in Half Cups, and I knew I had to try them. I’m amazed it took me this long to get around to it. Why are they “frugal?” Why, because it is a great way to use that sourdough toss off, instead of literally tossing it off. Every time that flour mixture goes down the drain, something inside of me cringes. I used my white starter, Son of Boris, to make these. Boris Senior passed away last year, but Junior seems to be made of sturdier stuff. I followed Tanna’s recipe for the most part, but when I couldn’t find my sparkling water or Aleppo pepper, I winged it by adding regular water, about 1/2 tsp. of cayenne pepper, and some garlic powder and salt. Like Tanna, I found that one soft ball-sized onion was more than enough for my husband and me. These really benefit from liberal seasoning, so next time I make these I’ll increase all the spices. 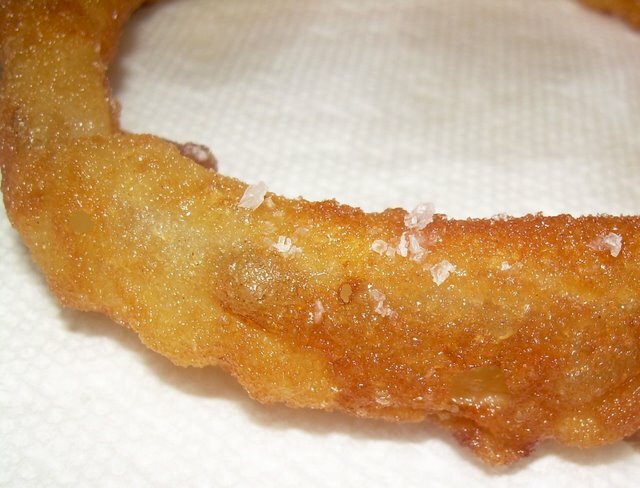 The coating was crisp and light, and the rings were best piping hot. 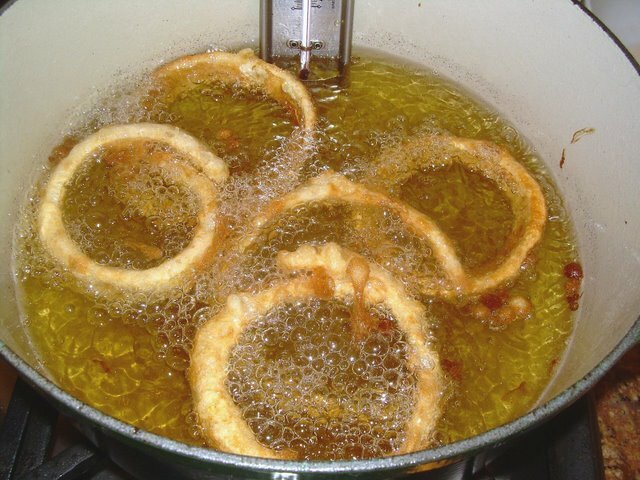 We stood at the stove and ate them as they came out of the oil, and were so full that we couldn’t eat dinner. I find that my tolerance for grease has decreased dramatically with age. But, obviously, not my taste for it. Heh. 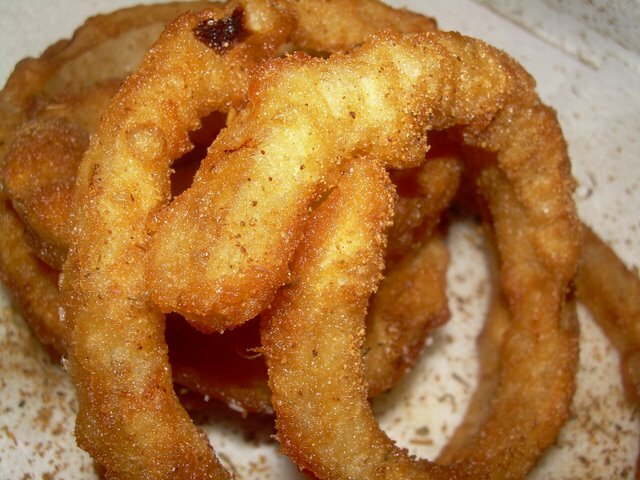 These onion rings have been Yeastpotted! If you want to join me for Frugal Fridays, see here for more info. continue reading "Tanna’s Sourdough Onion Rings for Frugal Fridays"
continue reading "A Multigrain Bread for Bread Baking Day #20 and Frugal Fridays"
When you’re a member of about, oh, six or seven cooking groups (I lose count), you have things like mascarpone, butter, and premium chocolate laying about the house. That’s just the way it is. So, after a recent Tuesdays with Dorie tiramisu cake, I had some mascarpone left over. Mindful of keeping my girlish figure, I decided to make brownies. BWA HA HA! 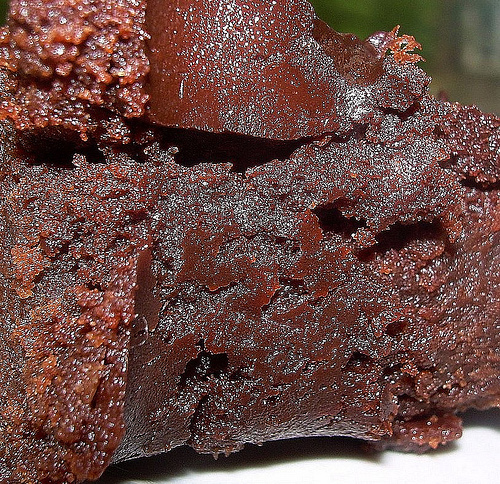 These brownies got better after a day or so, and while they were moist, I like them a bit fudgier. My husband said the same thing, and proceeded to eat most of them, and he’s not even a chocolate person. I used 70% chocolate because I usually think brownies are too sweet, but I think next time, I’ll mix in some semi-sweet chocolate to smooth things out a bit. Thanks to Linda at Tender Crumb, who found the recipe via Teanna’s Spork or Foon? And she found the recipe at Recipezaar. If you want to join me for Frugal Fridays, just email me with a link to something you made using what you had around the house. You didn’t have to have made it in the last week, but you did have to blog about it in the last week. 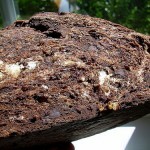 continue reading "Frugal Fridays – Chocolate Mascarpone Brownies"
There are so many chocolate pudding recipes out there. Quite a few of them are rich, tasty, and require the use of numerous bowls and the tempering of egg yolks. Well, I’m here today to free you from all that. 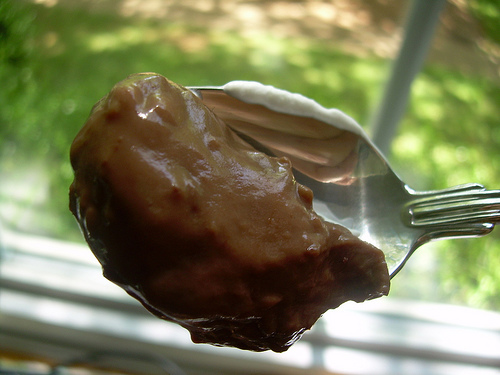 Today, I introduce you to the chocolate pudding recipe of my childhood, which I made throughout my teenage years. And I found it on the side of the Argo cornstarch box all those years ago. This is sooo easy, and you can use any combination of milk that you like and have on hand: milk, half-and-half, some cream (don’t make it with only cream). You can mix it up in one pot, and you’ll only have to clean some measuring cups, spoons, and a strainer, besides the pot and spatula. Your family will not care that it didn’t take you an hour to make this, because it will taste better than those packaged pudding mixes, and you’ll be able to sit down and enjoy it with them, instead of washing a bunch of dishes! 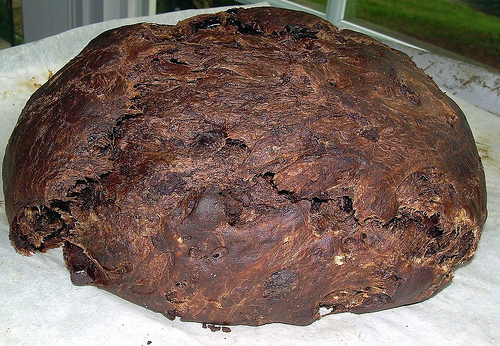 And who couldn’t use a little chocolate now and then? Want to join me for Frugal Fridays? See the instructions, here. Recipe after the jump . . . .
continue reading "Frugal Fridays, and an Easy Chocolate Pudding from My Childhood"
One of my favorite colors is green. Just looking at these collards makes me feel so healthy. I often have vegetables lurking about in the refrigerator, next to the butter, eggs, and cream (heh, heh), that need to get used up. 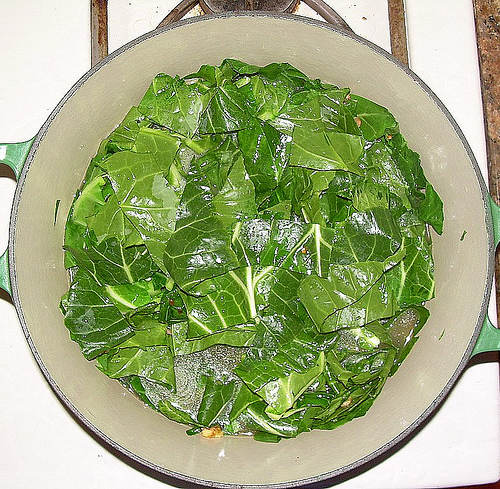 Traditional Southern-style collards are cooked a long time, with a ham hock and some butter. Because of the high fat consumption around here due to my baking, I really try to cook as healthfully as I can, so a few years ago I started experimenting with collards, and this is what I came up with. Clean and trim a bunch of collards (about 1 to 1.5 pounds), discarding the thick stalks. Do not dry off the collards. Chop coarsely and set aside. Chop 3 cloves of garlic (more if you like a strong garlic flavor), and set aside. In a heavy bottomed pot, over medium heat, preheat a couple tablespoons of extra virgin olive oil. Toss in the garlic and a large pinch of red pepper flakes, and stir for about 30 seconds. Don’t let it burn. Add the collards, and enough vegetable or chicken broth to just cover them. Add some kosher salt and pepper, and some garlic powder if you like. Bring to a low boil, boil for about 7 minutes, then turn down the heat to medium low, cover, and cook gently for another 23 minutes. Check to see if the collards are tender (they won’t be mushy like traditional collards), and adjust seasoning. 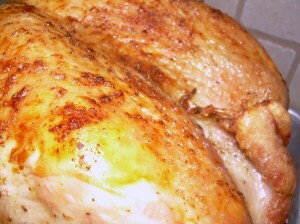 Are you cooking frugally? If you are, and want to join me, send me an email by noon on Thursdays, linking to something you made in the past week. There are only three rules: (1) you made it in the past week, (2) you made the dish (it can by anything – appetizer, baked good, etc.) 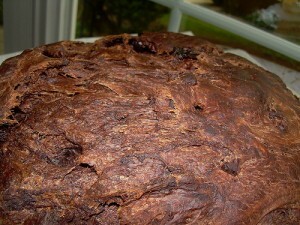 with ingredients that you had on hand in your home or garden, and (3) link back to this blog and mention Frugal Fridays. I’ll add the link to my post. If somehow I miss you, or I’m out of town, or your email gets to me after noon, I’ll include you in the following week’s post.